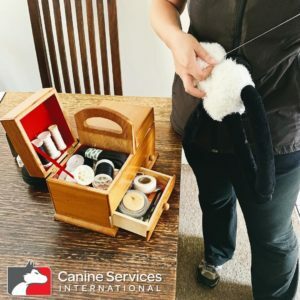 Home / Canine Services International Dog Training Blog / Puppies and their favourite toys – sometimes they are loved to death! How many of you have found yourself stitching up your dogs fave toys to extend the joy they can bring your dog? This photo shows a dear friend of mine stitching up ‘Panda’, her dog’s #1 fluffy toy.